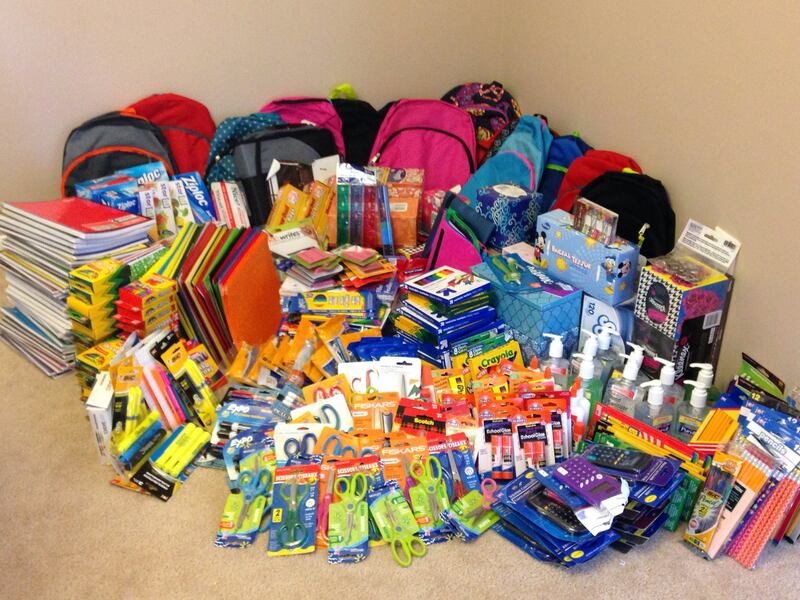 Each chapter is asked to complete at least one service project per year benefiting families and children in need. It is a great way to teach our children the importance of giving! 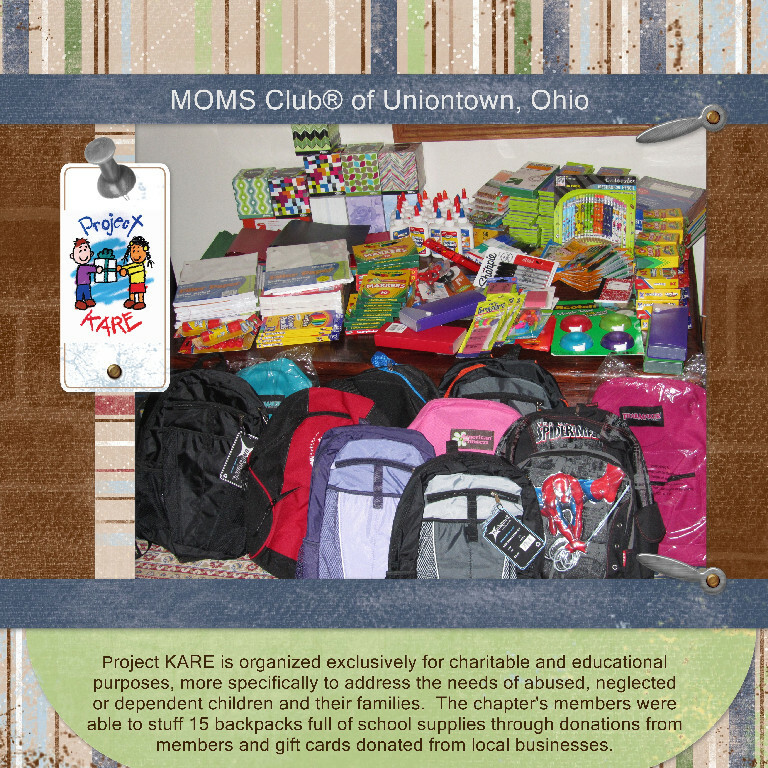 The MOMS Club® of Uniontown, OH has proudly completed the following projects and has raised a combined total of over $7000 in five years! 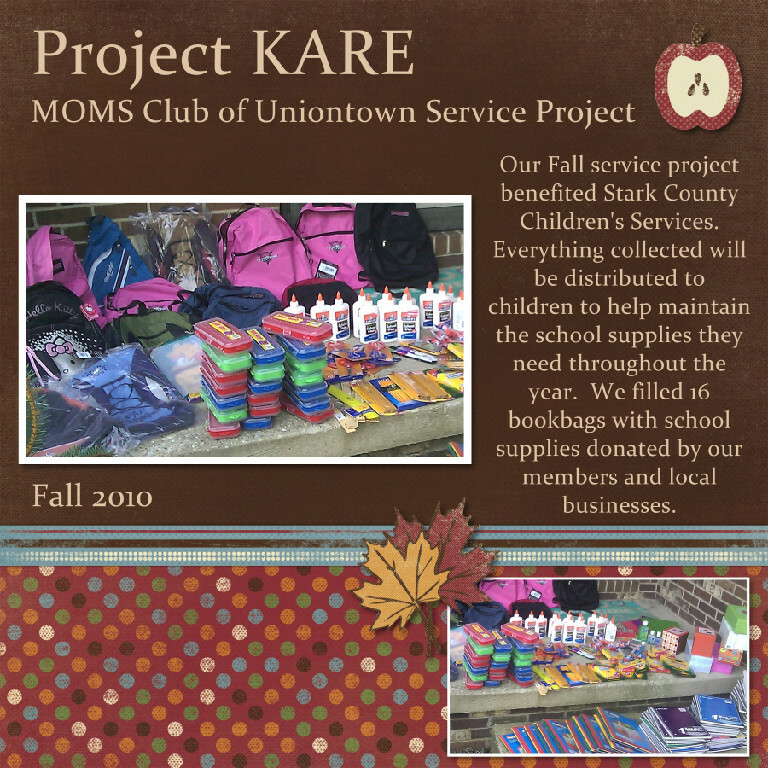 Project Kare 2015 – 443 total items collect for donation! Operation Christmas Child 2014 –Packed 20 shoeboxes for children in need! Toy Swap 2012 – In addition to recycling some fabulous toys, we donated the remainder to Green Good Neighbors. The 3 stuffed bags and 2 full boxes were distributed to families in need in our communities. Check out Club News for a close up of their response letter! Salvation Army’s Adopt-a-Family – In December 2012, one of our dedicated members, Rebecca, had the wonderful opportunity of delivering our presents to the Salvation Army for an adopted family. We were able to collect 7 presents for each child and a few for mom. 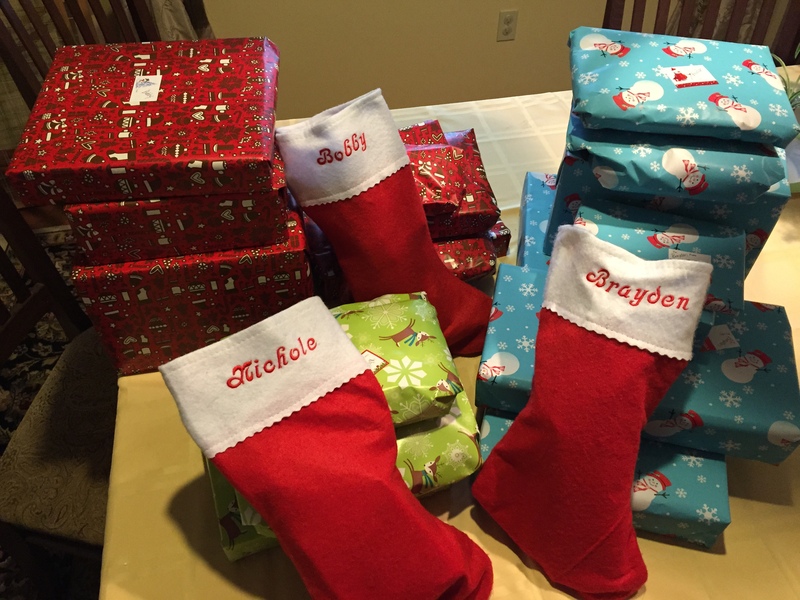 We also filled up individual stockings with their names embroidered on them and were able to purchase a $200 Giant Eagle gift card for a Christmas meal! 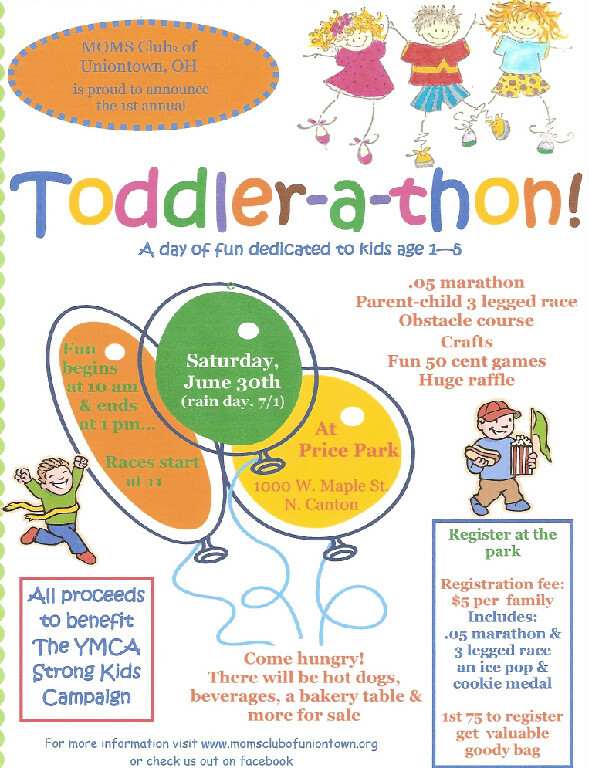 Toddler-a-Thon – In June 2012, we raised $1605.74 for the Strong Kids Campaign at the North Canton YMCA. Have a Heart…Do Your Part – In February, 2012, our members collected $133.26 in change to help WKDD’s annual Have A Heart…Do Your Part radiothon to benefit the Akron Children’s Hospital. Toys for Tots – In December, 2011, our members collected toys at our annual Breakfast with Santa to donate to toys for tots. Swap; Green Good Neighbors – October, 2011. 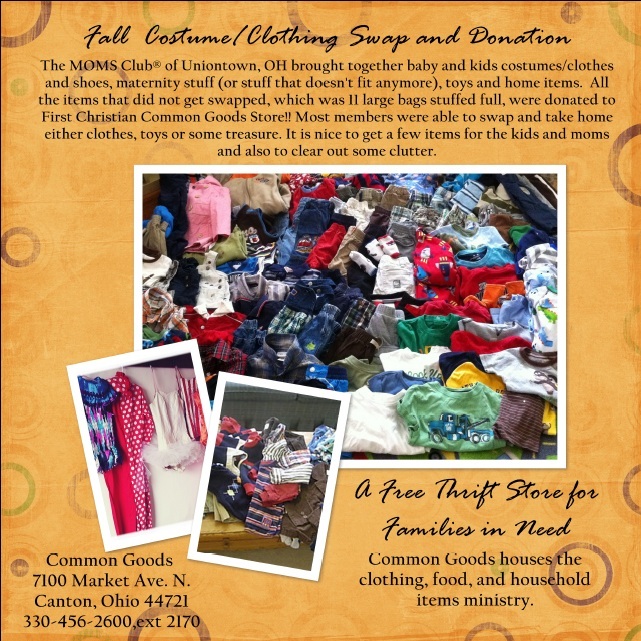 The moms did some fall cleaning and donated 36 boxes of clothing and household goods to Green Good Neighbors. Alex’s Lemonade Stand – On June 22, 2010, we set up a Lemonade Stand at the Green Farmers’ Market. We filled our cups and helped to raised over $400 to donate to Alex’s Lemonade Stand Foundation which is committed to finding a cure to all childhood cancers. Autism Speaks – In June 2010, we donated $100 to help Autism Speaks in their dedication to funding research into the causes, prevention, treatments and a cure for autism; increasing awareness of autism spectrum disorders; and advocating for the needs of individuals with autism and their families. Veteran Memorial Park – In June 2010, we were able to help the City of Green reach toward their goal of completing the VeteransMemorial Park by donating $100. Make A Wish – In June 2010, We donated $100 to the Make A Wish Foundation of Ohio, Kentucky, and Indiana to help toward granting the wishes of children with life-threatening medical conditions to enrich the human experience with hope, strength and joy. Have a Heart…Do Your Part – In January, 2010, our members collected $50 in change to help WKDD’s annual Have A Heart…Do Your Part radiothon to benefit the Akron Children’s Hospital. Akron-Canton Regional FoodBank – On April 17, 2009, we held our Crop for Hunger which was a 7 hour scrapbooking event to benefit the Akron-Canton Regional FoodBank. We were able to collect 181 food items as well as raise $797.50 that the FoodBank can use to provide 5579 meals. Have a Heart…Do Your Part – In January, 2009, our members collected $60 in change to help WKDD’s annual Have A Heart…Do Your Part radiothon to benefit the Akron Children’s Hospital. 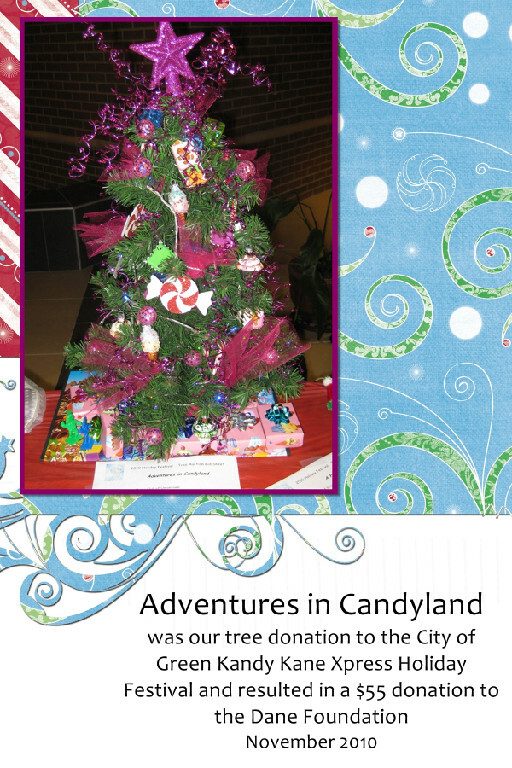 Akron Children’s Hospital Tree Festival – In November 2008, we raised over $600 in fundraisers through Macy’s shopping Day and Friendly’s Fundraiser Day to donate a decorated Christmas tree to the Akron Children’s Hospital Tree Festival. In addition to the purchased ornaments to decorate the tree, we added handmade ornaments and a handmade tree topper as well as presents under the tree. We are very excited that our tree sold at the Night of Enchantment and to have contributed $650 to the Akron Children’s Hospital! Akron Children’s Hospital ACBC (Aluminum Cans for Burned Children) – On August 15th, 2008, we collected aluminum cans all summer and delivered them to the Green Fire Station. The ACBC uses the money from recycling the aluminum cans to help support burn victims through camps and programs, fire safety programs and to help with needs not covered by insurance. Spring Carnival for Charity – The MOMS Club of Uniontown hosted a Spring Carnival on April 18, 2008 to benefit Green Good Neighbors. Children learned the importance of giving by donating a gently used toy for admission to the carnival. Carnival games and food were a huge hit with all the youngsters and the MOMS Club donated $160.00 and more than 40 gently used toys to the Green Good Neighbors! FUNdraising Day at Max & Erma’s – We took a day off from the kitchen and let Max & Erma’s do the cooking for our families on April 10th, 2008. We raised $134.40! Adopt A Family – MOMS Club of Uniontown adopted two military families for the 2007 holiday season — a local family in Wadsworth and a family in New York State. $613.78 in presents for the children and parents were purchased, wrapped, and delivered by our members. Crop for the Cure – Our first annual Crop for the Cure was a HUGE success held on October 13, 2007. We raised $1442.50 for the Northeast Ohio Chapter of Susan G. Komen for the Cure. JDF Walk – Members of The MOMS Club of Uniontown raised $650 for the JDF Walk held at the Cleveland Zoo on Sept. 29, 2007. Chick fil-A fundraising night – On August 15th, 2007, members and their families helped clean tables for a few hours at Chick fil-A and raised $185 to be put into our service project fund.